Time to start digging through the kitchen cabinets! Though it's no surprise that midcentury modern looks are back in vogue, it turns out that the trend extends not just to furniture but to — of all things — Tupperware. Yup, that old Tupperware that's been sitting around the house for decades might be worth quite a bit more than its original cost. E-commerce sites like Etsy and eBay are full of "vintage Tupperware" listings with people selling everything from pitchers and coasters, to canisters and measuring cups — even oddities like salad dressing holders and cake covers are up for auction. Back in the day, Tupperware even made toys. 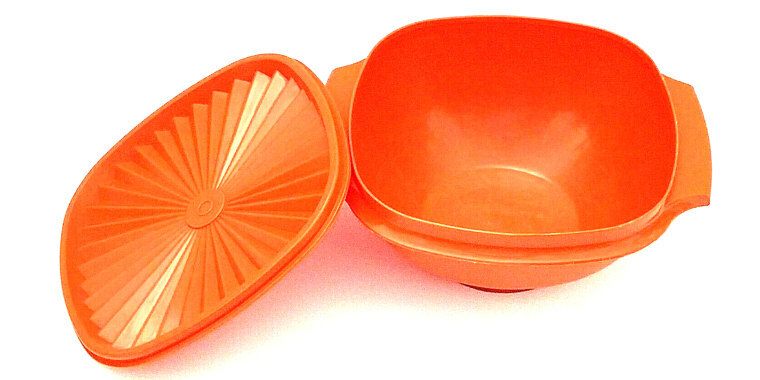 This week's vintage Tupperware item from me is yet another Shape-O-Ball, with 9 shapes, 1 shape is missing. Though no one is likely to become a millionaire from selling old Tupperware containers (the pieces aren't going for hundreds of dollars like vintage Pyrex dishes), select sets from the pastel-hued Wonderlier line or the Servalier line (which features bolder opaque tones) could certainly net the seller a few hundred dollars — depending on the condition and age of the pieces. Stacy Verdick Case, the owner of Peony Lane Designs in Minnesota (who sells vintage Tupperware at her brick-and-mortar store, as well as online through Etsy), told TODAY Food that most of her items sell for between $4 to $20 apiece. Originally, many Tupperware pieces sold for about $2. However, according to the popular antiquing site Dusty Old Thing, select single items in great condition may sell for up to $60. To score a great deal, Case recommends scouring garage sales, where clever buyers might be able to score a vintage piece for as low as 50 cents. To authenticate any piece of Tupperware, look for a two-part number (its mold number) stamped somewhere on the product and make sure the word "Tupperware" is also visible. "If you are really lucky and hit an estate sale of a former vendor who has old stock from their selling days, you can get a whole set in mint condition for a couple hundred dollars," she said. The most popular items, according to Case, include those in the "Crystal" color, since Tupperware still makes replacement lids in that hue, as well as the midcentury "Millionaire" line of pinks, greens and blues. Other hot pieces include salt and pepper shakers with atomic stands from the 1960s and the gold canister produced in the 1970s. Case said that it's likely due to a mix of nostalgia for those who remember using the old Tupperware when they were growing up and the fact that these pieces are still functional. "The midcentury colors are lovely, and they ... make sense [economically and environmentally] for the millennial generation," she said. "And since Tupperware was made to nest and store in tight spaces, they make sense in the tiny home generation." The Facebook group I love My Vintage Tupperware features dozens of listings for old sets of tumblers, sandwich keepers and even containers designed for egg storage. While most listings are pretty modest, users can also posts requests for specific items and some avid collectors may be willing to pay a premium to complete a set. In the process of writing this article, I discovered that I have a colorful colander that was passed down from my mother-in-law, and I did not even realize it was made by Tupperware! Though some classic plastic colanders are selling for up to $40, unfortunately the version I have in my cabinet is selling for about $10 on the auction site. So I think I'll just keep it and use it at home ... for now. Of course, Tupperware still sells plenty of new items, too, and even has a Classic section on its website for new versions of items that resemble throwback pieces. Apparently, Tupperware parties are still a thing, as the company currently hires "consultants." But today, those consultants can hold a "party" online, in addition to setting up at a home. And while you're rummaging through your cabinet, keep an eye out for any old Pyrex dishes — they may be worth a lot more!